The LDSE technology utilizes the properties of a laser in the presence of a phosphorus doping source to melt a silicon wafer. This process incorporates phosphorus dopants into the molten silicon thereby exposing the silicon surface. 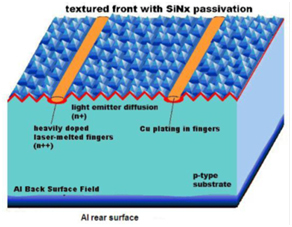 Subsequent self-aligned metal contact formation is achieved with light-induced plating. Novel firing conditions used in the LDSE technology facilitate the achievement of Voc values approaching 700mV on standard commercial grade p-type CZ material. Consequently, metal lines are only 20 microns wide, and have perfect alignment to localised heavily doped regions. The antireflection coating is retained in non-metallised regions and acts as a plating mask, providing excellent surface passivation and antireflection qualities. LDSE avoids degradation problems associated with high temperature thermal processing; shading loss caused by wide lines, and eliminates the use of expensive silver pastes. LDSE technology can be retrofitted to Screen Print Lines, allowing application of the technology readily achievable for commercial lines. NewSouth Innovations is seeking licensees for the LDSE technology as well as collaborative research partners to take the advanced LDSE technology for double-sided and bifacial solar cells to market. To view a PDF version of this document, please click HERE.